From time to time I make the effort and paint a landscape which is ‘real’. This involves not adding or subtracting from a scene in order to make it fit an idealised version of the world. I find if I don’t make the effort to just ‘copy’ the scene and resist ‘converting’, the paintings begin to drift into the ‘dreamworld’. In this world objects and places are stylised and tend towards abstraction. The ‘real’ interpretation of the world is the common language, between the artist and the public, and this language needs to be updated from time to time. This painting is an exercise in observation and restraint. Staying awake and not drifting into the ‘dreamworld’. I find it difficult, it is like trying to stay awake when all you want to do is fall asleep and dream. The painting is like ‘sketching from nature’ which was always considered good for the painter – I would agree with this advice, it keeps the painter grounded. I would like to be able to stay between the real world and the world of the imagination. The above painting is very tame (and real) compared to a paintings like ‘Wood Cutters‘ or ‘Bluebell Wood‘ where the scene is recognisable, but not in a ‘photographic’ way. Thanks to Morphodidius for the comment on the previous painting, putting into words what the paintings have been saying. Maybe ‘dreamscapes’ are not as bad as I thought. The colours for this painting were: Burnt Sienna & Raw Umber (red), Cadmium Yellow (yellow) and French Ultramarine (blue). I was intending to include a few Daffodils in the painting, that’s why the Cadmium Yellow is there, but these were ‘flowers from the imagination’ and in line with the above sentiments – no daffodils. Cadmium Yellow is a very strong colour and not a natural landscape colour. It produces miserable greens with Ultramarine Blue. I included a little of this yellow all over the painting, even the sky, so its strong sulphur yellow in not dominating any particular area, when used as in the foreground on left. I’ll have the video of the painting process in the next day or so. See you then. This entry was posted in Oil Painting and tagged Art, Culture, Education, Inspiration, Irish landscape, Oil Painting, Oil Painting Instruction, Oil Painting Landscape, painting, Realist, Time lapse painting. Bookmark the permalink. I love the water as well. Incredible. I’d love to be able to paint water as perfectly as you have. It looks as if it would actually ripple if I touched it. Thanks, the photo of the scene is in the next post. The picture definitely looks “real”. The water looks like you could dip your hands in it. Real or unreal, it is all dreamy when it emerges from your talented self. Thank you for sharing your lovely work. This indeed a lovely painting. I like your comments on the difference between creating realism and dreamscapes. In my digital art I start with a photo. It does not have to be a good one. It is just the foundation for exploration into those abstract dreamworlds you spoke of. But restraint is what gives the piece its closure. How right you are, to know when enough is enough. Like your other noters, the water and the reflections are magical. 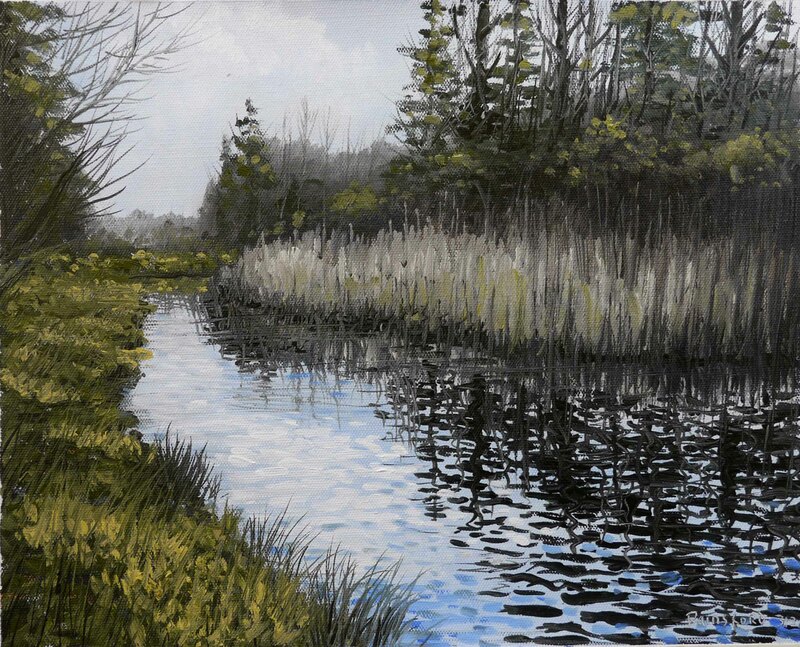 My immediate reaction to this painting was a smile and longing to visit a nearby lake with similar reeds here. The tips you offer, such as the yellow color and what it does in a painting, are invaluable. Incredible,its so lively,just can’t praise enough. Thanks Indira, for the nice comment. All your paintings are so marvelous, I am still in nursery class. Thank you for the kind words Indira. Thank you for your comment. You should have loads of inspiration in the Rocky Mountain wilderness. What incredible scenery. I just copied it from a book,original is marvelous, I am nowhere near that,but thanks for your comment,coming from a renowned artist its an honour,there are lots of mistakes I posted it hoping someone would point out the mistakes and i will learn something. Thanks. How you paint water it looks so real. This is truly great…..and as many others have said….I love the water! Love the movement in the water! Of all of your paintings I have seen on this blog – this one I love – it speaks to my heart. If this is what you call “reality” – can we have more? I can’t wait to see the video. Thank you – this old portrait painter is learning so much from you. Thank you Sadaniel. I like your portraits. Even in observation and restraint you have offered the scene in a magical way! And I like that! Beautiful. I love how the blue of the water is even more rich than the sky, like a sign of good things to come. What a beautiful talent you have! I, like others, thought at first glance, mistook the painting for a photograph. I only dabble with paint on canvas when I’m stuck in my writing. Having no expectations, I apply color and look for the writing creativity to kick back in. Thanks for the comment John, and thanks because it prompted me to revisit your site and explore your work. I consider my work dull and am delighted when I come across vibrant interesting stuff. You are too kind my friend but I really appreciate your comment and am honoured for your visits and Follow at art rat cafe. However, I do need to disagree with what you said about your work – “dull”? No way is your work dull and you have only to read all the hundreds of comments sent to you to know that you are alone in thinking this. Not only is your art brilliant but your teaching is interesting, varied and supportive and offered with an obvious love and true passion. I was a high school art teacher for 22 years and I know fine instruction when I see it. Your blog is the best of its kind I have seen and your positive influence on so many is very obvious. Your postings are too many for me to explore at one time but already I have learned so much. Thank you for this and I am now Following you in order to learn more.